A widespread approach to solving the Cauchy problem for Laplace’s equation is to reduce it to an inverse problem. As a rule, an iterative procedure is used to solve this problem. 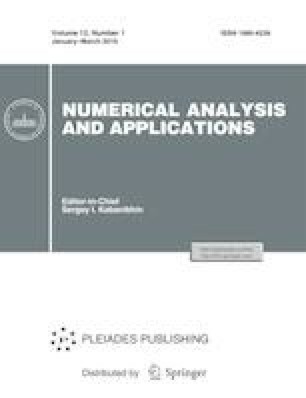 In this study, an efficient direct method for numerically solving the inverse problem in rectangular domains is described. The main idea is to expand the desired solution with respect to a basis consisting of eigenfunctions of a difference analogue of Laplace’s operator. Russian Text © S.B. Sorokin, 2019, published in Sibirskii Zhurnal Vychislitel’noi Matematiki, 2019, Vol. 22, No. 1, pp. 97–114.